Place your construction paper on the table in front of you; orient it lengthwise. Cut along the lines you've drawn. If you're using pinking shears or fancy scissors, cut along the outer edges, very close to the edge. Use the poster paints to paint bright flowers all over one side of your construction paper. Let the paint dry. Using poster paint, paint the three jumbo craft sticks on one side. Let the paint dry. Now paint the other side of the crafts sticks. Paint the edges, too. Let the paint dry. 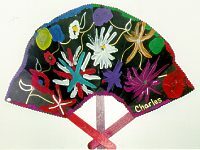 Now, fold the construction paper into a fan. Glue the top of one craft stick to the back of the right-hand side of the fan. Make sure the edge of the stick meets the edge of the paper. Glue the top of one craft stick to the back of the left-hand side of the fan. Make sure the edge of the stick meets the edge of the paper. Glue the top of one craft stick to the back of the fan in the middle of the fan. Make sure the stick points straight down from the fan. Glue the loose ends of the three craft sticks together, crossing them over one another (see photo). Let the glue dry.